Hello lovelies. Do any of you suffer from dry skin? I have always had super dry skin and since hitting my forties and having my girls, even more so. 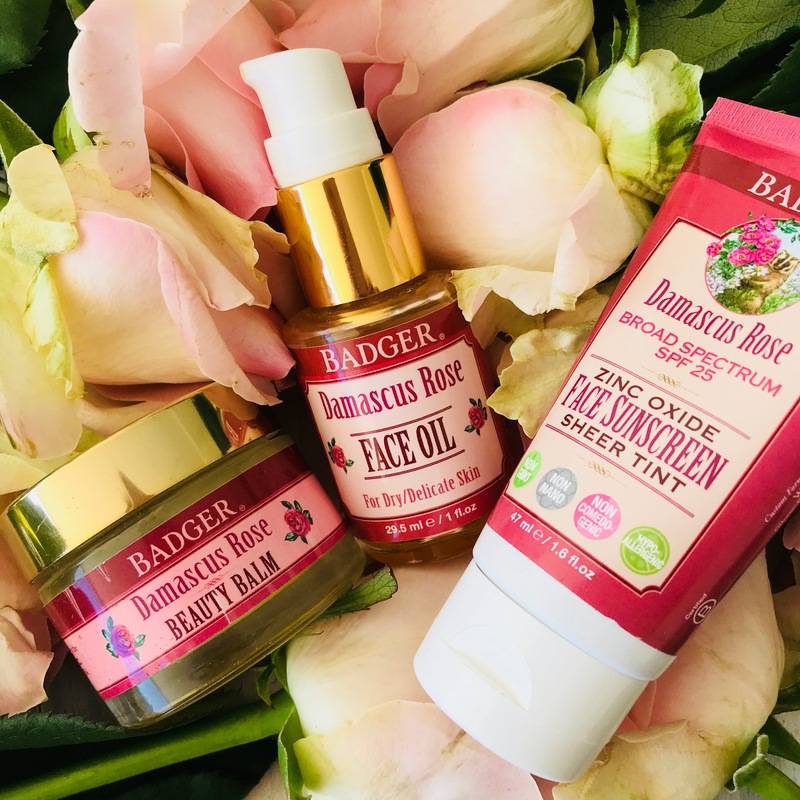 So when I was sent some samples of Badger Damascus Rose Face Oil, Balm and Sunscreen to try, I was thrilled – my skin was so parched it felt like the timing couldn’t have been more perfect. Now that I’ve come to the end of my balm I thought I would give you my thoughts on this product. First off, I’m a fan of the Badger Brand. It’s been around for many years and is one of the most trusted organic beauty brands there is. Theirs is the only sunscreen I use on Charley and Ava and has been since they were born – it’s thick and quite gloopy but neither of them has ever been sunburnt and the tubes seriously seem to last forever! First off, I am absolutely mad about anything rose scented. I have bath oils and milks (which sadly can’t be used at the moment), I wear Roses de Chloé almost every day and the Jo Malone Red Roses is also a favourite. And of course I’m a sucker for a rose fragranced soap. I am also a big fan and proponent of oils especially for *ahem* older skins like mine. I love to give myself a peel a few times a week (I use the Dr Dermal Texture Correction Pads) and after that I like to slather on this oil – it takes a while to penetrate the skin and then when I’m about to go to bed I slather on some more. My skin really is that dry. But here’s the kicker – my skin looks and feels amazing the next day. Glowy and dare I say it, even a little dewy. This particular blend contains quite a few oils including Jojoba Seed Oil, Pomegranate Seed Oil as well as Lavender, Rosehip and Damascus Rose Oil. These oils and the rose oils in particualr are crammed with antioxidants and essential, moisturising lipids. Interestingly, rose oil also has antiseptic properties which is good news for those who suffer from acne so although I recommend it for those with dry skin, it can be used on oily and combination skin too. My verdict: I will definitely buy this again and a little goes a very long way. I have been using the oil consistently for months now and I still have half a bottle left. I also use it on my décolleté which I’m noticing is super dry these days. The label says to use day and night but I’m wary of oils in the day in our sunny climate even though I wear factor 30 every day so I stuck to using it at night. The oil costs R370 from Faithful to Nature. Another note: this gets a 4.7 on Makeupalley and 94% of people would repurchase the product – so it’s not just me who loves it! Balm is not my first choice of consistency when it comes to face products but since I figured my skin could only benefit from the intensity of the moisture on offer I dived in. And I’m so glad I did. As with the face oil, a little really does go a long way and the heat of your fingers when applying the balm makes it melt so the application is easy. If you suffer from dry skin, you definitely need a serum under this and I wouldn’t say it’s heavy enough to wear as a night cream – many of the reviews I read on Amazon say people like to use this as an intense cream for fine lines around the eyes or lips. The balm is a blend of fruit oils and beeswax which makes it another potent and all-natural offering, and it is not as fruity and rose smelling as the oil, but it’s still lovely. The jar is compact yet crammed with a lot of product so there’s a lot of balm for your buck. I’d definitely order this again (you can buy Badger beauty products at Faithful to Nature) – the balm costs R359. Badger Damascus Rose SPF 25 Tinted Face Sunscreen. I am fair and freckly and the auto immune medication that I inject every two weeks makes me susceptible to skin cancer so I am pretty paranoid about sunscreen. I’ve been using the same sunscreens for a few years (Lamelle and Bioderma) and I was keen to see what the Badger Damascus Rose tinted factor 25 was like. It contains non nano uncoated zinc oxide and protects from both UVA and UVB rays. Sadly I found the texture too chalky for my liking and my dry skin. The colour was also a little on the chalky side and looked a bit unnatural. I imagine someone with oilier skin might like the matt finish this sunscreen offers but it isn’t for me. There is also an untinted version and both cost R399. All in all, if you’re someone who wants a product that hasn’t been tested on animals, contains organic and ethically sourced and traded ingredients, smells delicious and is aesthetically pleasing too (sorry if that sounds shallow but I find so many natural products are packaged in really hideous packaging), then this is a lovely spoil. And one that delivers. 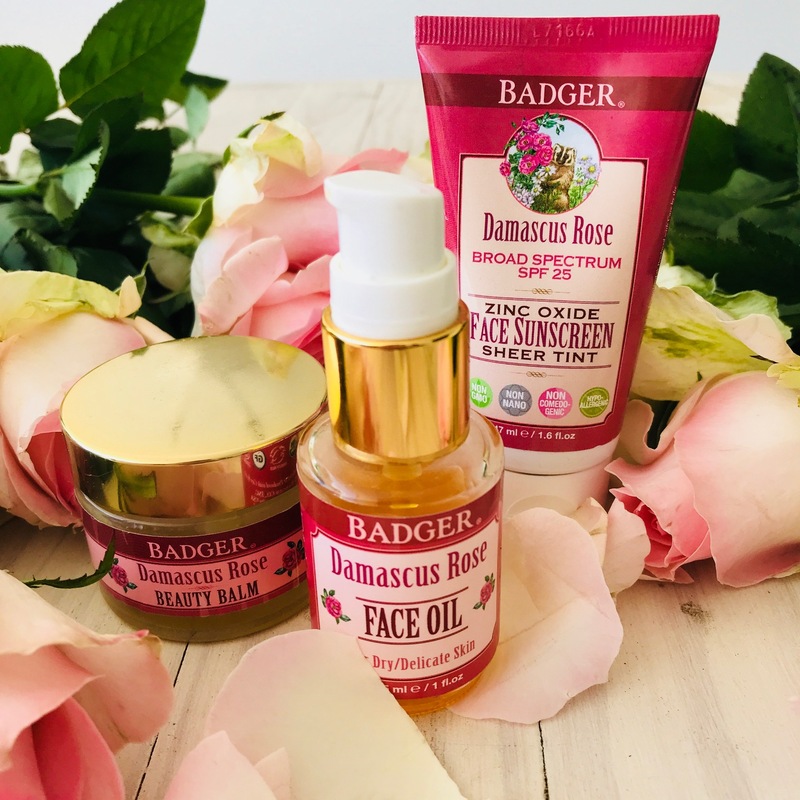 I really rate the oil as a bi weekly skin pick me up and if you’re after a hydrating daily moisturizer, then the Badger Damascus Rose Beauty Balm is a great choice (and it’s wonderful as a mask for hands too). Hope you found my review useful, lovelies! Sounds interesting – will try it soon – thank you for the information!